Comedian Jack Benny stars in "Buck Benny Rides Again" (Paramount 1940), a spoof on Westerns that was partially shot in Placerita Canyon. Interiors shot on the Paramont lot on Melrose in Hollywood; other exterior locations include the Paramount Ranch in Agoura, as well as Palm Springs and Victorville. The whole cast from the Jack Benny Show (on radio) turns out for this one including Ellen Drew as the female lead; Eddie Anderson as Rochester; and regulars Andy Devinem Phil Harris, Dennis Day, Virginia Dale, Lillian Cornell, Theresa Harris, Kay Linaker, Ward Bond, Morris Ankrum, Charles Lane, James Burke, Don Wilson, Fred Allen, Mary Livingstone and the Merriel Abbott Dancers. Hollywood — All over the lot: Many of the scenes for "Buck Benny Rides Again" are being filmed in Placerita Canyon, the place where gold was first panned in California. The actors havce tried a little prospecting, but mostly they just sit around and pan the picture. Jack Benny has the title role, but says he expects to run third in importance. Rochester will steal the picture from him, and there's a trick bear that's likely to steal it from Rochester. There's also a trick horse, Shamrock, which Benny rides but can't steer. Shamrock pays no attention to the reins: he works, instead, according to arm signals. "Paramount is the only studio that makes me wear makeup," grumbled Andy Devine, who plays a dude-ranch owner. "I don't like it. Why, not even the horses have to wear makeup." "Okay," said Director Mark Sandrich. "Go wash your face — and then have one of the boys put a saddle on you." Benny and Lillian Cornell, a new actress from radio, were playing a scene that had to be rehearsed and shot many times. AFter awhile a herd of cattle that were supposed to be milling in the corral in the background ... stopped millling and began to lie down. "We must be pretty bad," said Benny. "I see we're even putting the props to sleep." 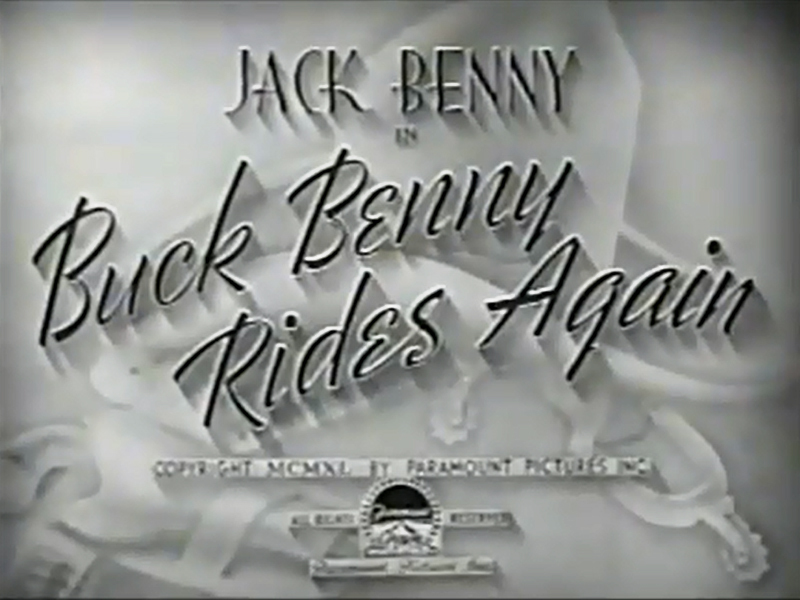 "Buck Benny Rides Again" premiered April 24, 1940, in New York City. It opened in U.S. theaters May 3. "Buck Benny Rides Again" was reprised Nov. 2, 1952, as Season 3, Episode 2 of "The Jack Benny Program" on CBS. New sequences appear to have been shot, possibly on the Jauregui Ranch in Placerita Canyon. But don't quote us on that.